Mullvad has been in the privacy game for a while, even back when VPN wasn’t so “mainstream”. When putting together this review we have been very cautious and have taken everything with a pinch of the salt due to the hype which exists around Mullvad as a product. When we began reading some of the information online, we didn’t believe all of it. However, after carrying out the research we can certainly see why it is such a talked about VPN service. Mullvad offers an anonymous and private service which will fully secure your internet connection and provide completely anonymous browsing. Mullvad provides a comprehensive VPN service without compromising on features, using OpenVPN and WireGuard VPN protocols which are the industry standard. Does Mullvad really deliver a VPN service to rival the bigger players on the market? Does it deliver complete anonymity? Does it reduce your downloading speeds? We answer all these and more in our thorough review of this unique VPN service. Common sense dictates that if you are using a VPN which routes your traffic through multiple servers then it is going to take longer to get results. No VPN can deliver the same speeds you would get when you’re not connected to one. However, some do perform better than others, and Mullvad is one service which does just that. Whenever you use a VPN you are taking the long way round to your destination. Whilst this is unavoidable, one thing you can avoid is using a VPN which has a serious negative impact on your speeds. Connecting to a Mullvad server in Europe and a Mullvad server in the U.S., I tested my 300Mbps download speeds (which usually average out at around 280Mbps when not connected to a VPN) against Mullvad. These are very impressive results and I am still able to access the same high speeds I am accustomed to whilst being connected to their VPN service. Mullvad does not have a “torrenting policy” per se, however, they allow the use of their VPN service for torrenting and P2P-related purposes. They even offer a handy guide about how to use BitTorrent securely on their network. This is one of the main reasons for using a VPN, so it is hardly surprising that a service as liberal as Mullvad allows it. We’re glad to say Mullvad made our list of top VPN recommendations for torrenting! You can even buy a subscription at retail stores! Mullvad offers only one plan and pricing level. It is 5 EUR (around $5.80 US) per month for full access to their services. This is a very budget-friendly price, even when you don’t factor in the fact that Mullvad is a VPN that offers the highest level of safety, security, and speed. It can’t get any simpler than this. Mullvad offer ones of the widest range of payment methods we have ever encountered. Yes, even cash – Mullvad takes postal orders for its service. All you have to do is send your account number and cash to cover the amount of time you want access to the service in an envelope to their address. For example, sending over 17 EUR would buy you 100 days. But remember, there are no refunds on cash orders due to AML laws. With Bitcoin, you may even receive a secret 10% discount which isn’t even stated on their website. Sign-Up Process: Best in the industry? Simply visit the Mullvad website and download their VPN to use it. You will be assigned a randomly generated, unique account number. You will need to write this down and keep safe as this is used for all correspondence with customer service and to sign up for their premium subscription. No one can connect your username to you, there is no password to link to you, and you don’t have to provide any personal details. For anonymity, this kind of sign-up process is the best. Their sleek yet simple-to-use website is a great preview of the product. Mullvad is very simple to use on desktop and features a friendly click-and-go interface like other modern VPN services. For use on mobile, again, you need to go through an OpenVPN setup process which is not user-friendly and is quite complex. Mullvad’s website has a comprehensive knowledge base which, whilst helpful, does not go too in-depth about the product. Whilst the VPN is documented a little bit throughout their knowledge base, there are areas where it could be improved. With more data breaches occurring now than ever before, it is super important to use a VPN where there is zero possibility of IP leakage, and by following standard VPN industry practices by utilizing AES-256 Encryption they can ensure this doesn’t happen. 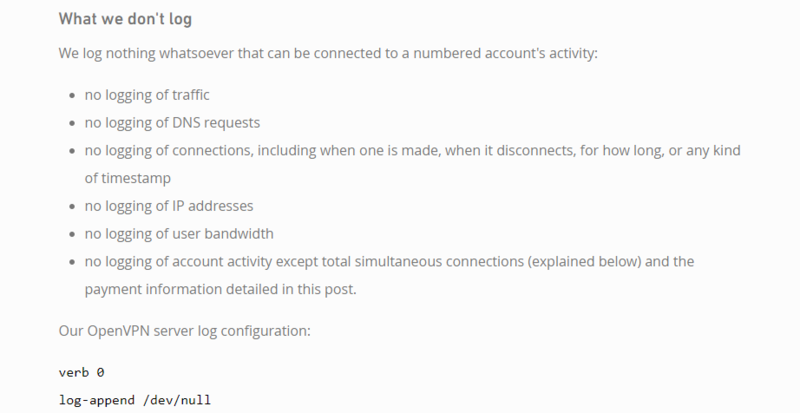 Mullvad’s logging policy is helpfully summed up on their website. In other words, absolutely no logging whatsoever. They even went as far as to share their OpenVPN server log configuration! Mullvad’s DNS leak testing tool said we were all good, but what does a third-party tool show? In addition to this, Mullvad offer all their users protection against DNS leaks as standard. This is important because DNS leaks can create a map of your browsing history, defeating the point of using a VPN. Attacking DNS servers is a major goal of cyber attackers and it’s good to see that Mullvad protects against it. When we tested Mullvad against our third-party DNS leak checker, the results were good! This demonstrates that you are fully protected against DNS leakage with Mullvad. So far as DNS leakage is concerned, Mullvad gets full points all round! WireGuard is an open-source VPN tunnel protocol which creates secure point-to-point connections. It is extremely simple, fast and modern, using state-of-the-art cryptography to protect you whilst you are using the Mullvad VPN service. OpenVPN is very similar to WireGuard and is used to create secure point-to-point connections. When used in conjunction with WireGuard, OpenVPN provides a super secure connection which cannot be interfered with by third parties. AES-256 Encryption is one of the world’s most secure encryption methods after 128 and 192-bit, and is used in modern encryption protocols to encrypt and decrypt data packages and files. Mullvad does feature a kill switch in its advanced settings with options you can manually set to control how the VPN client operates. A kill switch is a critical piece of VPN security and it is a feature which any VPN should have. 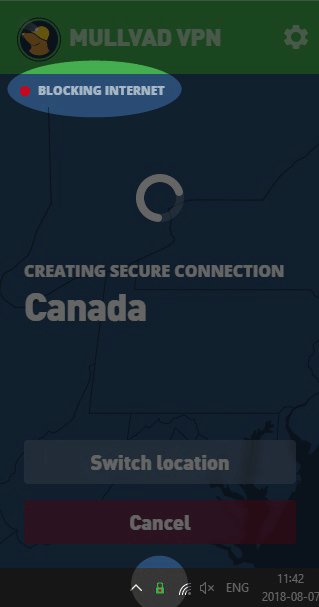 A kill switch prevents your IP address from ever being shown online if your VPN connection should drop and you lose connection to the VPN network. At the time of writing this review, Mullvad servers were available in 31 different countries with 265 active servers. There are additional 49 WireGuard servers available as well. It is also a service which can be used in China (it’s not blocked by the authorities). Mullvad lists all its live servers on their website. This amount of countries covered means that Mullvad offers its users an unbeatable experience, and they are always updating their servers to counteract blocking and provide more options for its users. Now, this is where things get a bit tricky. 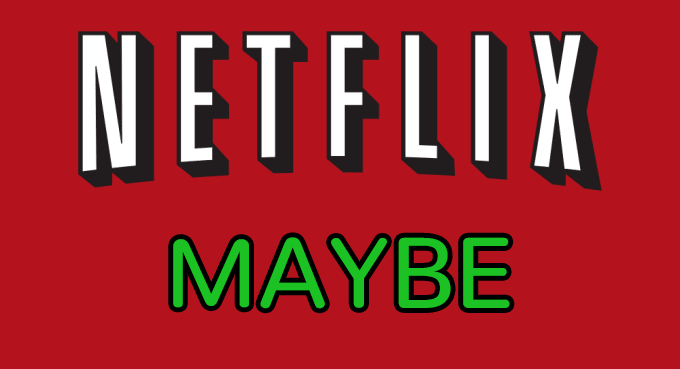 Mullvad can be used to access Netflix on some of its servers, but not all. This is inevitable as Netflix is always working to block servers they associate with being part of a VPN. At the time of testing, I was able to access Netflix on its New York server, its San Jose server, and its Texas server. However, on most of the other U.S. ones, it wouldn’t work. With accessing Netflix, it’s going to be potluck whether you can access U.S. Netflix – and indeed Netflix in other countries – when connected to the Mullvad VPN service. For a more reliable experience, we recommend these VPNs that can unblock Netflix. Mullvad supports Windows, macOS, Linux, iOS, and Android. This range of devices covers most users around the world. 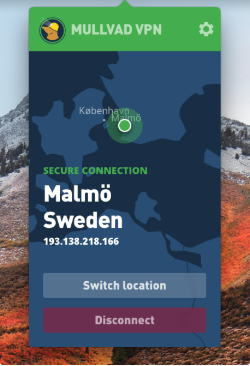 While Mullvad VPN can be installed on smartphones, you need to go through a lengthy and complicated OpenVPN setup if you want to use it outside of a personal computer. Which, when compared to other providers, means they’re trailing behind. But in some cases, this may be beneficial since most apps ask for intrusive permissions. There is also no word about whether Mullvad can be used on devices such as TVs and consoles. And no official word on either their website or support channels in regards to this topic. There is no live chat support service, and its email-based support service can also be a bit lackluster. By emailing [email protected] you are able to receive basic-level support, however, their responses, whilst quick, can be a bit vague. Given that Mullvad is not the most user-friendly VPN out there then this lack of support could be a major problem for potential users. If you think you may need to rely on their support service heavily then Mullvad may not be for you. It has been commented on that Mullvad also only reply during Swedish working hours and does not have a dedicated team of support staff. Whether this is something which will come in future remains to be seen. Mullvad operates under Amagicom AB, a Swedish company founded in 2007. 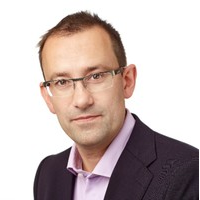 The company’s newest CEO, Jan Axel Jonsson, joined in 2016. Being in Sweden they are under the Fourteen Eyes alliance, but let’s not forget they have a zero-log policy. The Swedish authorities report that Amagicom AB had an annual turnover of just over 8 million Swedish Krona in 2017, which equates to just under $900,000 US. What’s more interesting is, the company reported having only 9 employees in 2017. It’s no wonder their customer support may seem lacking. But let’s remember, businesses often outsource, meaning they probably have more human resources than the reported 9 in 2017. Born as a Scandinavian company, we can see they also operate with the utmost highest standards. After all, the Scandinavians like to do everything properly. Our final verdict: we would recommend some other VPN like NordVPN. The product is slightly lacking and customer support is non-existent. If you are a savvy individual looking for comprehensive, no-strings privacy provided by a VPN service which does not require any personal details then Mullvad may be right for you. That is, if you are quite computer savvy and are willing to work with a slightly unfriendly mobile app environment. After all, it’s more about what’s under the hood, and Mullvad certainly delivers a quality product. 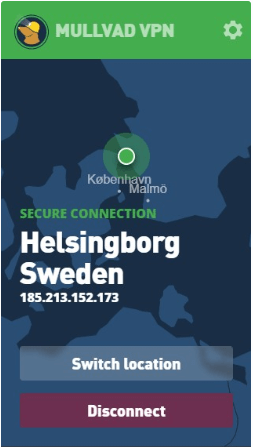 With over 200 servers across 31 countries, absolutely zero logging, no DNS leakage, compatible with Netflix and torrenting, all for the budget-friendly price of $5.80 per month, Mullvad VPN could be worth it. But if something about this review has left you looking for other options, we recommend you start with our top 10 list. + Super simple and secure signup process. + No IP or DNS leakage. - Customer support is lacking.